ISLAMABAD: This Eidul Azha witnessed a sharp rise in the number of animals sacrificed by residents of the urban areas and model villages of the federal capital. 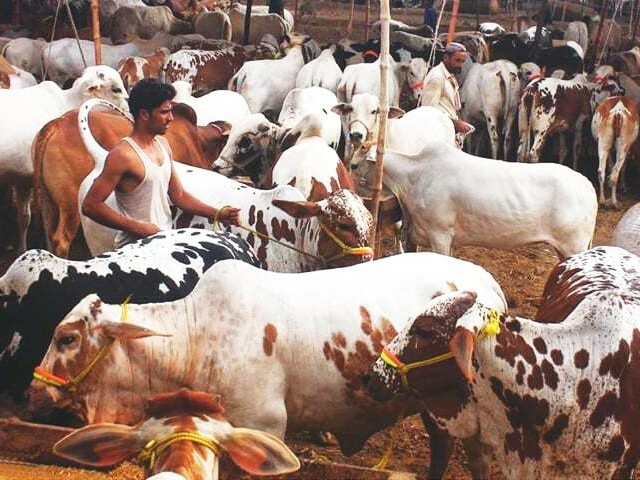 According to officials in the Islamabad Metropolitan Corporation (IMC), as many as 96,709 animals including cows, bulls, goats, lambs, buffalos, sheep and camels were sacrificed during the three days of Eidul Azha this year. This is 50 per cent more than the 60,000 animals which were sacrificed by residents of the city in 2017 and around 50,000 animals in 2016. “From August 22 to August 24, we collected and disposed of offal and remains of more than 96,709 sacrificial animals,” IMC Director Sanitation Sardar Khan Zimri told The Express Tribune. He said that a special cleanliness operation, for removal of offal, entrails and waste material of sacrificial animals had been conducted by Sanitation Directorate. Zimri further said that in past few years, they had witnessed a new trend in animals sacrifices during Eidul Azha due to which municipal authorities had to make additional arrangements and efforts to dispose of offal and other remains. He said that municipal authority had dug up 60 deep ditches and trenches at 30 different locations around the city where the remains and offal of sacrificial animals were disposed of scientifically. Giving the breakup of their cleanliness operation, he said that they had collected remains and offal of 58,832 small (goats, lambs and sheep) and 37,877 big (cows, buffalos, camels) animals. He added that they had divided Islamabad into five zones to better manage the cleanliness operation. Zone-I included areas of Saidpur, Sectors G-5, E-7, F-5, F-6,F-7,F-8,F-10,F-11 and Golra. Zone-II comprises Sectors G-6, G-7, G-8 and Blue Area. Similarly Zone-III includes Sectors G-9, G-10, G-11, and Merabadi while Zone-IV includes areas of I-8, H-8, I-9, H-9, I-10, I-11 and IJP Road. Zone-V comprised areas falling on the eastern side of the Islamabad Expressway including Sohan, Khanna Dak. Areas falling on Lehtrrar Road including Tarlai, Ali Pur, Farash Town and four CDA Model Towns and Bhara Kahu were also included in Zone-V. He said that more than 2,000 sanitary workers including sweepers, supervisory staff, contractor staff and officers participated in the cleanliness drive. Apart from the staff of the sanitation department, staff from the emergency and disaster management departments and other departments also assisted the operation. Moreover, he said that around 200 vehicles, including tractors with trolleys, shovels, dozers, trucks, compactors of the Sanitation Directorate, Machine Pool Organisation (MPO), Environment Directorate, Enforcement Directorate and other concerned directorates were used. Lime powder was also sprinkled and applied to the surroundings of areas where the sacrifices took place, around ditches and garbage trolleys. from where IMC sanitary workers lifted it.